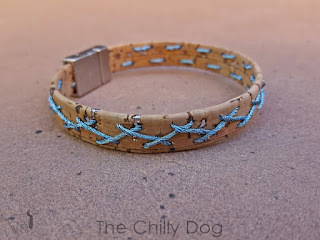 Today I have a bracelet tutorial that is similar to my Whip Stitched Cork Wrap Bracelet. 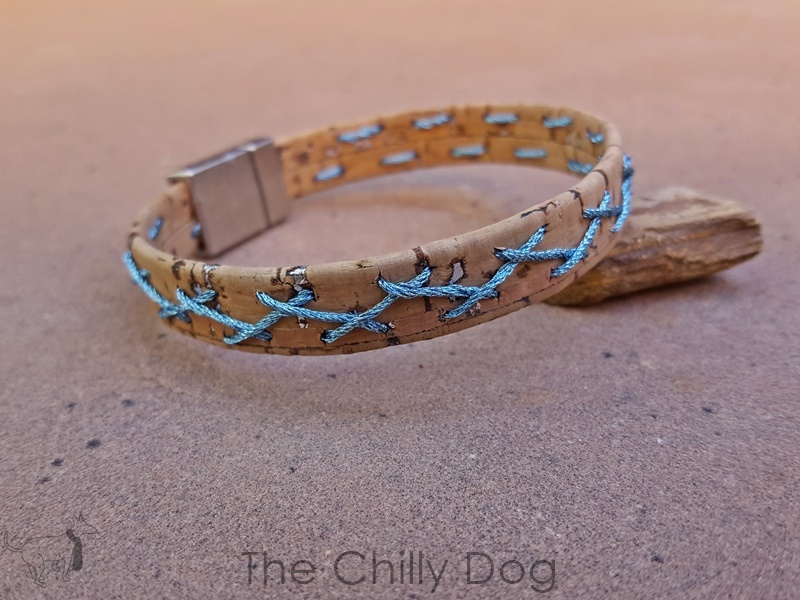 This one is a single wrap bracelet that uses a slightly more intricate embroidery stitch known as the herringbone stitch. Again, I used a shiny, metallic embroidery floss to highlight the silver flecks in the cork cord, but you could use regular floss if you prefer. 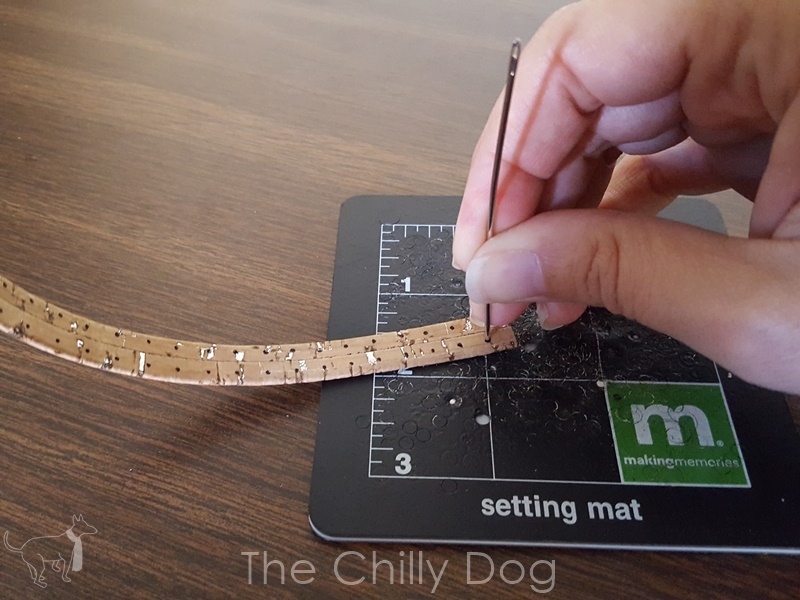 Many thanks to Endless Leather for providing the cork cord for this tutorial. 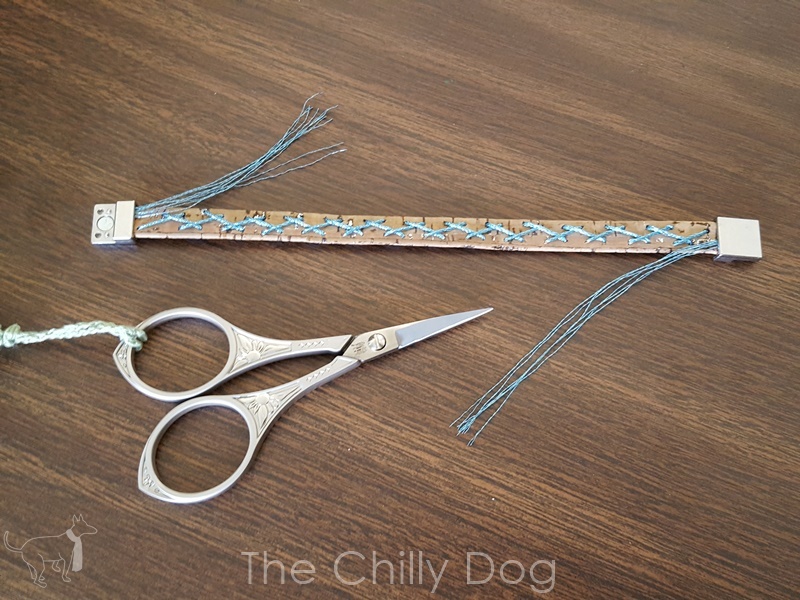 My bracelet is going to be 8 inches around so I cut my cork cord 7 1/2 inches long and the clasp adds 1/2 inch to the finished length. 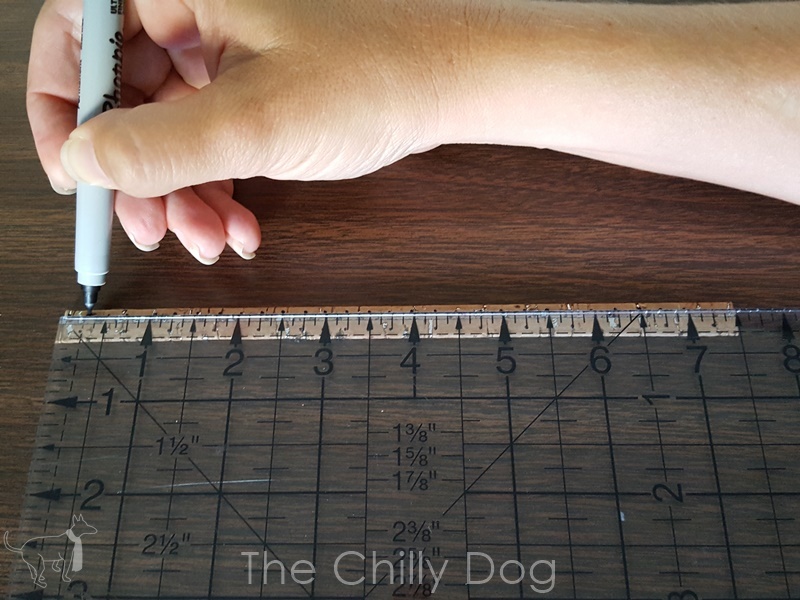 If you have very narrow or very wide wrists you may need to adjust the length of the cork cord. Just make sure the cord is cut to a 1/4 inch increment. 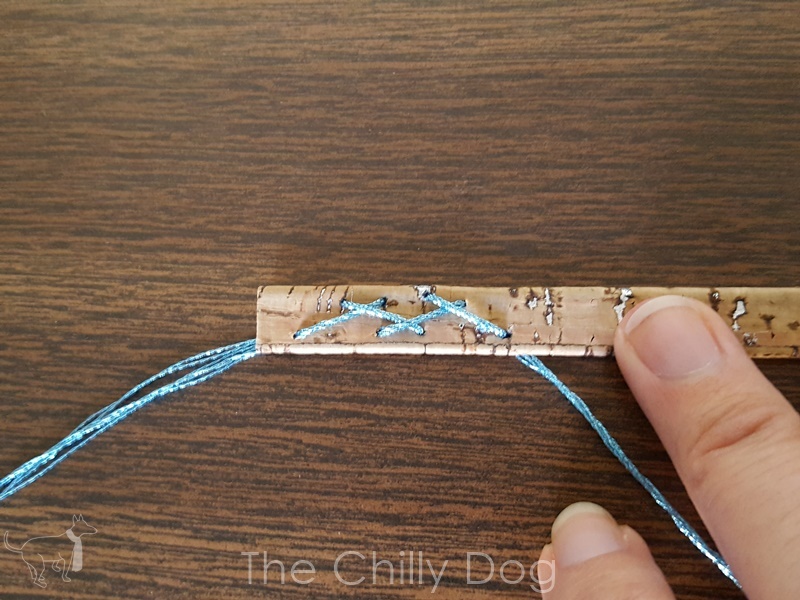 You can slide the clasps onto the end of the cord and try on the bracelet before you go any further. First, you are going to use a pen to draw to rows of marks that are 1/4 inch apart on the back side of the cork cord. See how the marks make a sort of grid pattern. Next use an awl or a large, sharp needle to poke through the cork cord at each mark. 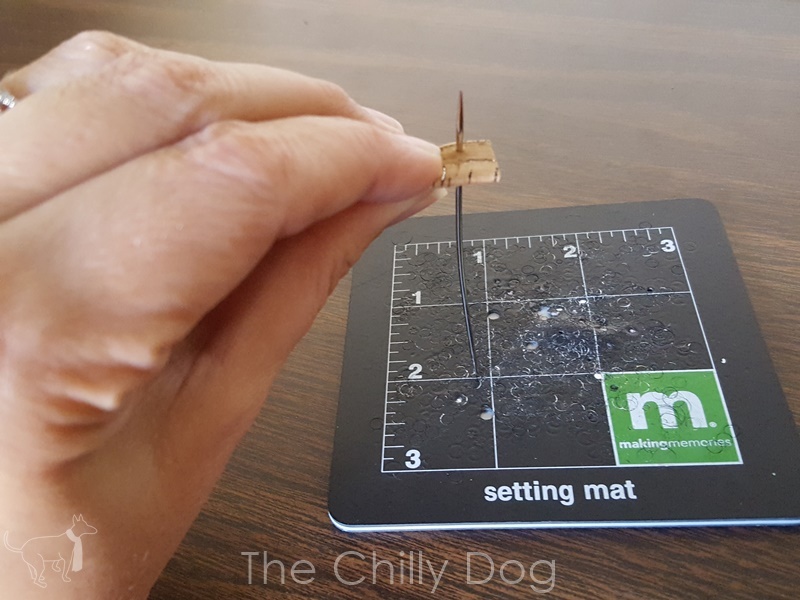 I recommend protecting your work surface with a small mat. 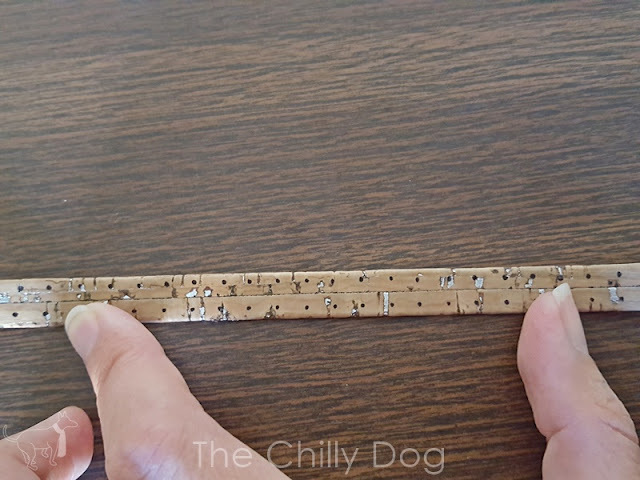 Be careful not to poke your hand while you are poking holes. Ouch! 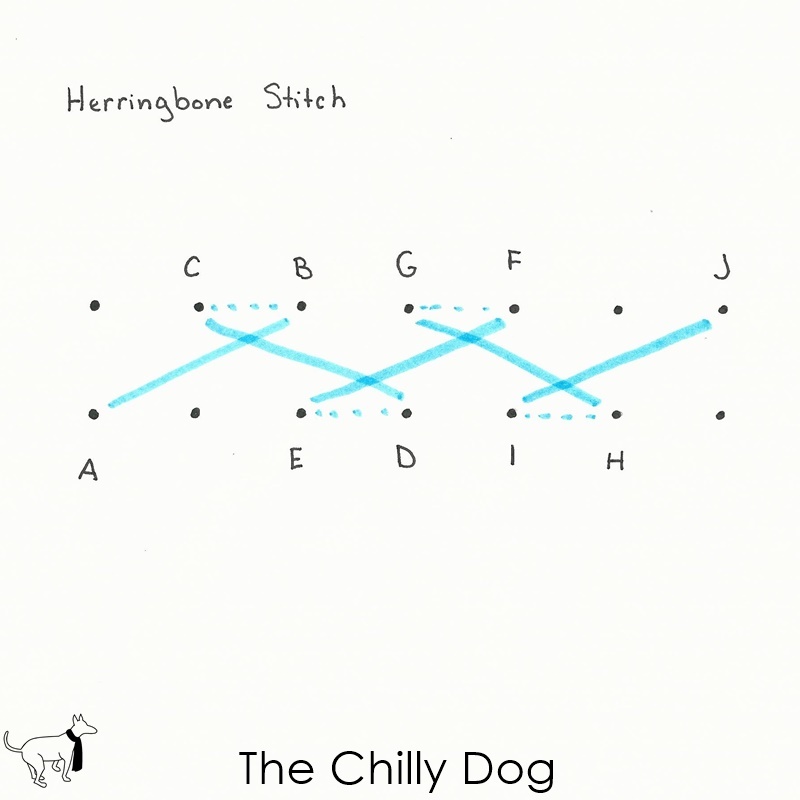 Next, thread a length of embroidery floss (all of the strands) onto a needle. 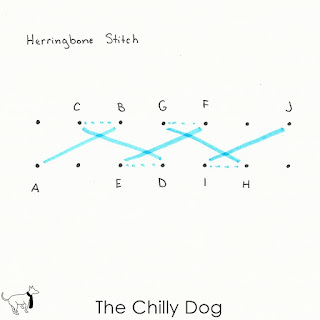 It's easier to show you the stitch with a diagram than a photo, so here it goes. 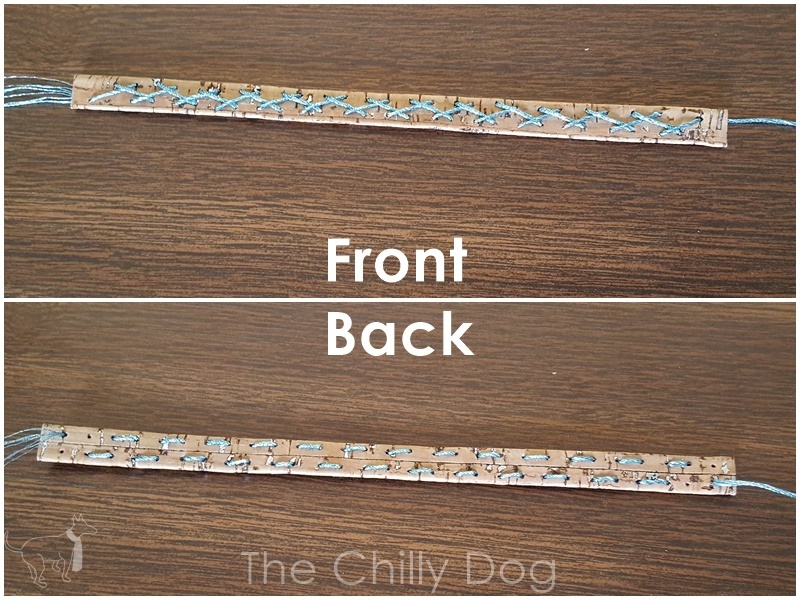 The solid lines show what the stitching on the front of your bracelet will look like. 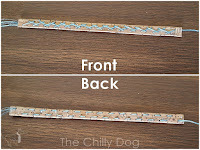 The dotted lines show what the stitching on the back of your bracelet will look like. 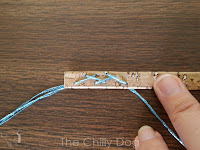 Starting at one end of the cork cord, bring your floss up (from back to front) through hole A leaving about a 3 inch tail. Continue along going down through hole B, up through C, down through D, up through E and so on. 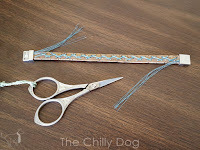 As I said, the front of the bracelet has the herringbone stitch. The back looks like two dashed lines. 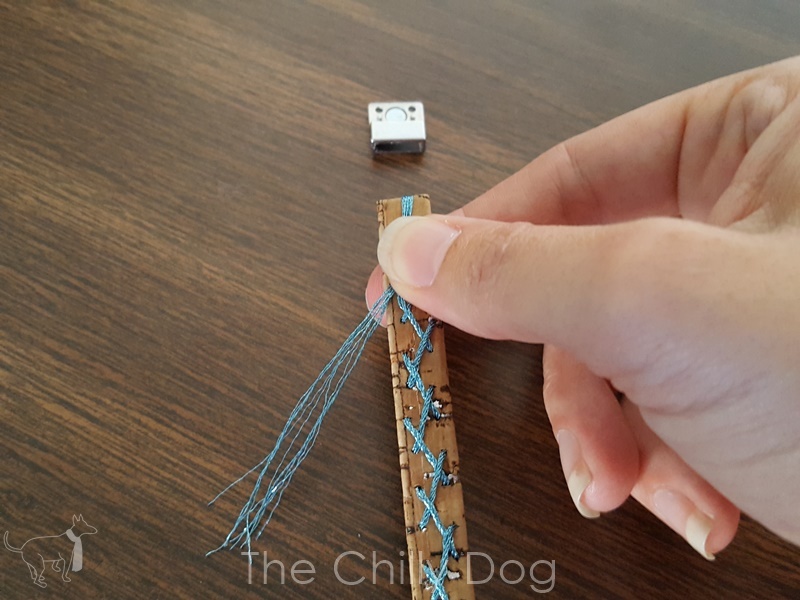 Trim the end of your floss to about a 3 inch length. 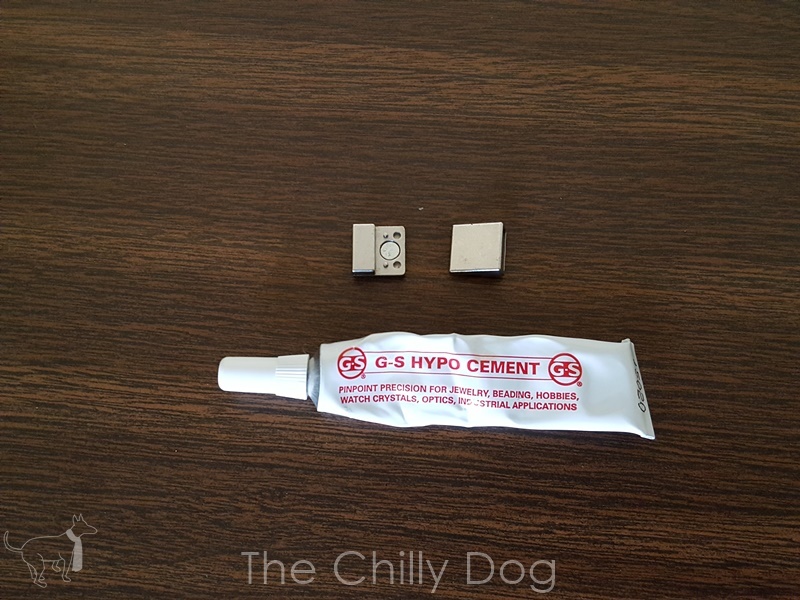 When your stitching is complete, apply a bit of G-S- Hypo Cement into each clasp. 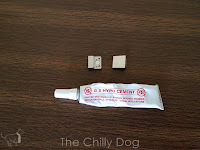 When you slide the cork into the clasps, make sure one of the magnets is face up and the other is face down or the magnets will not close properly when you are wearing your bracelet. 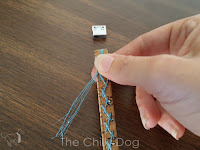 Tightly fold the embroidery floss over the end of the cord and slide the cord into the clasp. Repeat on the other end of the bracelet. After the glue is dry and the clasps are completely secured to the cork cord, use a sharp pair of scissors to trim the ends of the floss being careful not to cut through your stitching. Your bracelet is ready to wear for some casual summer fun! 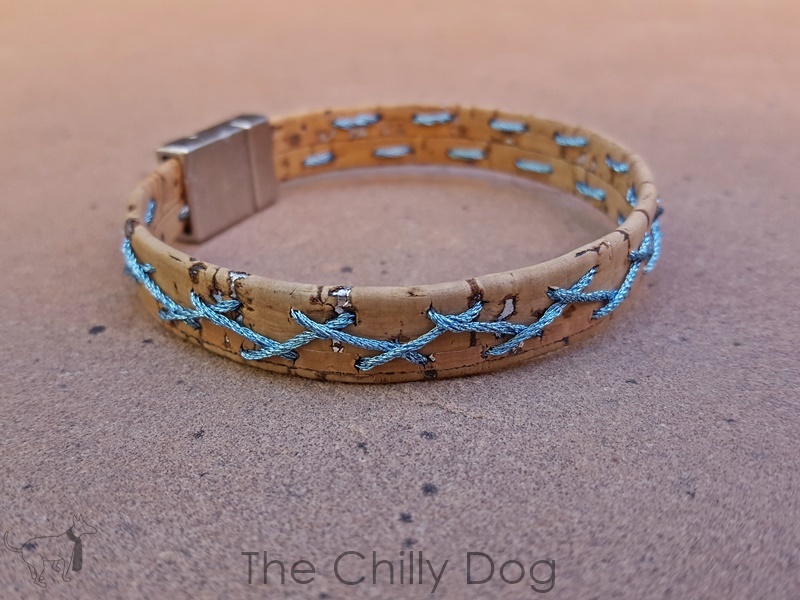 DIY a simply elegant summer bracelet using cork cord, metallic embroidery floss and a herringbone stitch.